Every year to celebrate March for Meals, Preble County Council on Aging holds its “Big Wheels” week, when prominent individuals from the community and county ride along with Home Delivered Meals drivers to deliver meals to local seniors. This allows the representatives to experience firsthand the difference Home Delivered Meals can make on a life. Pictured, Preble County United Way Director Alexa Joyce helped deliver last week. EATON — March was the 16th Annual Meals on Wheels Month. Preble County Council on Aging (PCCOA) is part of the Meals on Wheels Network, but the program is technically called simply “Home Delivered Meals.” Every year to celebrate March for Meals, PCCOA holds “Big Wheels Week,” a week when prominent individuals from the community and county ride along with Home Delivered Meals drivers to deliver meals to local seniors. The week was held Monday, March 19 through Friday, March 23 and brought many Preble County representatives to the center and homes of seniors to experience firsthand the difference Home Delivered Meals can make on a life. “We are having local dignitaries come in to ride along with the Home Delivered Meal drivers, in an effort to spread awareness of senior hunger and also the Home Delivered Meals Program. The event is called Big Wheels Deliver Meals,” PCCOA In-Home Service Manager Ashley Workman said. Seniors are accepted into the program through referral from others or even self-referrals. The program is funded through many different sources, one of those being community-based. Currently, Home Delivered Meals has a waiting list of 12. Community members can donate to sponsor a senior from that waiting list. The program is currently providing 30 seniors Home Delivered Meals. “These meals are helping those seniors stay in their homes. That is a major goal of the program, we want those seniors to stay in their homes as long as they can. Having Big Wheels and having people who are leaders in our community see our program and have a personal experience with the program encourages conversation about it with other leaders and people who have some sort of pull in the community to raise awareness about it,” Workman said. “This program makes a huge impact in the lives of Preble County seniors,” she added. “When we started this program in 2013, we were really only doing 60-70 a day. We have grown tremendously. We have seen a huge demand, our number of seniors are growing and we’re able to get out there, deliver them a hot meal, but also make sure they are safe and taken care of. That way, when they do need extra help staying in their homes, they can. 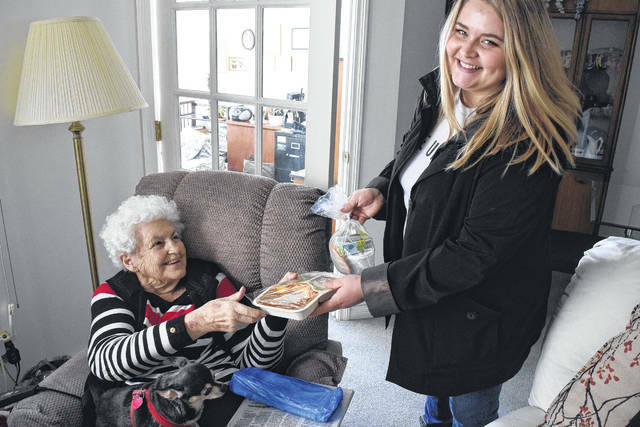 Home Delivered Meal driver Rosa Corey has been delivering meals for three months, but before that she worked at Preble County Council on Aging — in the kitchen. “I like meeting the elderly, to make sure they get what they need and make sure they’re not going hungry and have everything they need. All of the seniors are nice, I mean, sometimes there are days, but that is how it is with everybody,” she said. For area seniors, Home Delivered Meals are a huge help in their day-to-day lives. “I started getting meals this year. The meals help because I don’t cook anymore and I think its just a good prevision. It makes them easier and the meals are perfect, I like the combinations and all of it,” Phillis Massa said. “I’ve been getting these meals delivered since 2015. I lived in New Lebanon and moved out here in November of 2014 — I didn’t get started until January or February. The reason I get the meals is because I can’t cook and I can’t stand very long. I have a tendency that my legs go out on me,” Ryan said. 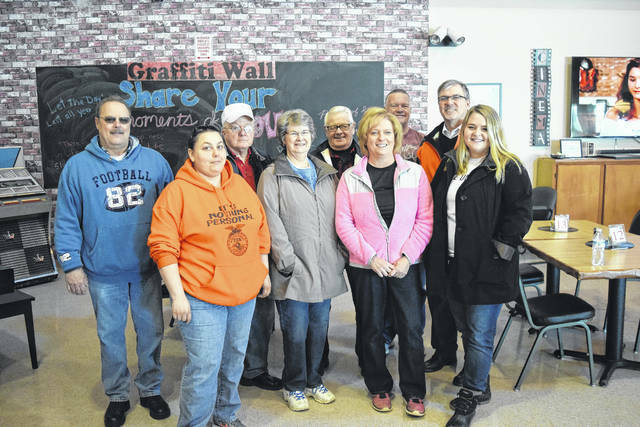 https://www.registerherald.com/wp-content/uploads/sites/41/2018/03/web1_Wheels2.jpgEvery year to celebrate March for Meals, Preble County Council on Aging holds its “Big Wheels” week, when prominent individuals from the community and county ride along with Home Delivered Meals drivers to deliver meals to local seniors. This allows the representatives to experience firsthand the difference Home Delivered Meals can make on a life. Pictured, Preble County United Way Director Alexa Joyce helped deliver last week.